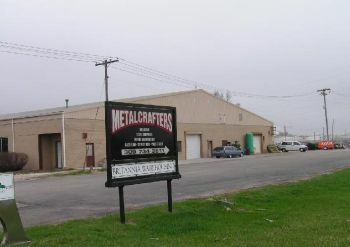 Metalcrafters is located in the old pottery barn building at 1201 North Main, Monmouth, IL 61462. From the south (Macomb) take 67 north and at the 2nd stoplight as you come into Monmouth take a left and Metalcrafters will be the first available right. From the North (Quad Cities) take 67 south as you approach Monmouth you will pass Farm King on the left and a little ways further you will come to an intersection where hwy 67 and 34 intersect. Immediately prior to this intersection, Metalcrafters will be on the left in the Pottery Barn building. From the East (Galesburg) take hwy 34 East to Monmouth as you enter town you will continue straight through the first two stoplights and at the third you will turn right and Metalcrafters will be on your right.